My blog last week gave Audi a gamma minus and suggested, amongst other things, that their logo should play an uber-prominent role this year of all years given that it is the nearest legal entity to the Olympics logo. 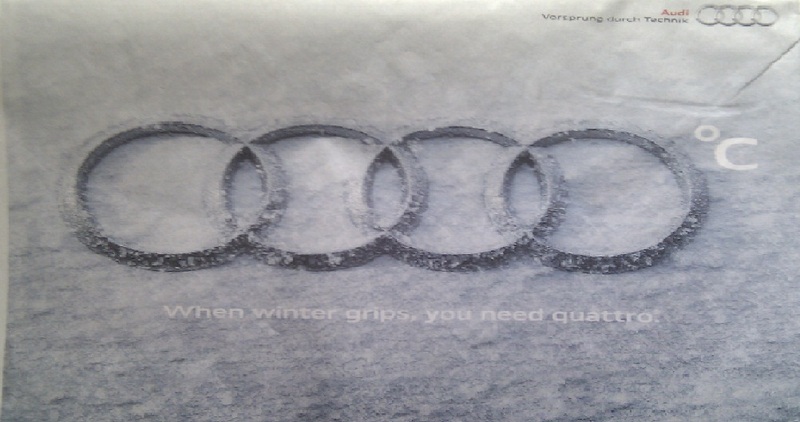 And lo... the attached tactical ad for the Quattro. If you haven't seen the ad it is a simulated tyre tread in the snow. This pushes all the right buttons, talks in a smart way about being safe and in a safe way about being smart, thus combining low risk with high impact.Pity the snow seems to have left us. Gripping stuff as they say in Germany.